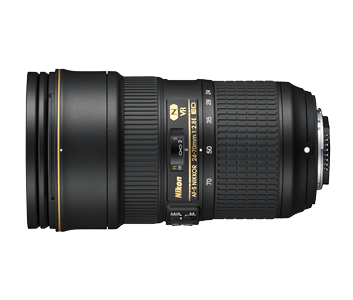 The AF-S NIKKOR 24-70mm f/2.8E ED VR sets a new benchmark in our relentless pursuit for optical precision. 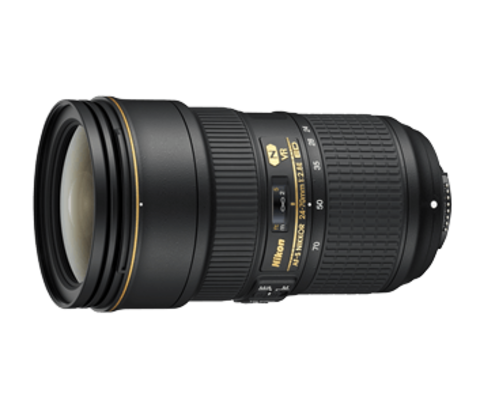 The first NIKKOR lens to feature an aspherical Extra-low Dispersion glass element, the AF-S NIKKOR 24-70mm f/2.8E ED VR is an FX-format 2.9x normal zoom lens that offers a maximum aperture of f/2.8 across the full focal length range of 24-70mm*1. It embodies a flawless synergy of NIKKORs finest imaging technologies, integrating a state-of-the-art Vibration Reduction (VR) system and a Silent Wave Motor for superior autofocus tracking. These innovations are further enhanced with an electromagnetic diaphragm mechanism that delivers stable auto-exposure control and Nano Crystal Coat to reduce ghost and flare. Engineered to redefine high quality photography, the AF-S NIKKOR 24-70mm f/2.8E ED VR will satisfy even the most demanding perfectionist. Whether you are a photojournalist, a commercial shutterbug, a portrait artist, or a wedding photographer, expect the AF-S NIKKOR 24-70mm f/2.8E ED VR to maximize the capabilities of your FX-format DSLR. This 2.9x normal zoom lens with a focal length range of 24-70mm*1 is indispensable in a professionals arsenal, offering the versatility of shooting in a staggering range of scenarios. The maximum aperture of f/2.8 can be leveraged at any focal length to achieve stunning bokeh, remarkable details, and dramatically sharp images. The AF-S NIKKOR 24-70mm f/2.8E ED VR is the first NIKKOR lens to feature an aspherical Extra-low Dispersion (ED) glass element which effectively corrects lateral chromatic aberrations, coma flare at the periphery, as well as distortion and spherical aberration. It also incorporates aspherical lenses, ED glass, High Refractive Index lens elements and Nano Crystal Coat that minimise ghosting effects and chromatic aberrations. These groundbreaking qualities ultimately deliver images of stunning sharpness and vivid clarity. The AF-S NIKKOR 24-70mm f/2.8E ED VR compensates for slow, wide panning movements with its latest VR technology, providing a shutter speed effect equivalent to 4.0 stops*2 faster in NORMAL mode. It also features an ACTIVE mode which stabilises the viewfinder image and minimises blurring in captured images when you are shooting from a moving vehicle or an unstable position. Crisp, sharp images can be achieved with every click. For smoother, faster, and quieter autofocus (AF), the AF-S NIKKOR 24-70mm f/2.8E ED VR comes with Silent Wave Motor that leverages on rotational energy to focus the optics. Its dynamic AF speed is optimised for capturing decisive sporting moments or fast-moving subjects such as animals. The AF-S NIKKOR 24-70mm f/2.8E ED VR is also equipped with an electromagnetic diaphragm mechanism for stable auto-exposure control, empowering you to achieve images of extraordinary quality even during high-speed continuous shooting. The AF-S NIKKOR 24-70mm f/2.8E ED VR enriches your photography experience, even in the most challenging conditions. With a rugged body crafted for superior durability, it is capable of withstanding shocks and drastic temperature changes. The lens barrel has also been meticulously designed for better clench and control. This revolutionary lens is further protected with a fluorine coating that repels dust, water droplets, grease, and dirt for fuss-free maintenance, so you can capture your creative vision, no matter where you are.